Since the new bathrooms were installed nine months ago in the Sports Centre at Monash University, cleaning staff had been battling with the removal of urine stains from underneath the men’s urinals. With the facility open for several hours after the cleaners finished each day, urine remained on the floor overnight, leaving behind brown stains. The porous nature of the epoxy floors in the bathrooms like those regularly seen in aged care and hospital facilities, coupled with the overnight exposure to urine, allowed the stains to seep into the floor surface. With no regular cleaning products able to remove the stains, cleaning staff needed to select a cleaning product to trial on the stains. While some aggressive products designed for tiles and concrete may have solved the problem, they could have damaged the surface which neither Agar nor Monash were willing to risk. Monash University also has a policy in place for selecting environmentally friendly cleaning products over regular supplies. The solution became clear: Agar’s Bac2Work Biological Cleaner. Bac2Work harnesses the power of naturally occurring good bacteria to consume odour causing organic materials. In the case of Monash’s Sports Centre, Bac2Work was able to consume the uric acid which had built up within the pores of the floor. Environmentally preferable, Bac2Work is designed to be used on urinals, toilets and floors as well as sink and waste outlets. Not to be used in conjunction with any disinfectants, bleach or caustic substances, Bac2Work is formulated to be left on problem areas for up to 12 hours at a time to ensure that the good bacteria has had the opportunity to consume the organic soil. With the facilities in the Sports Centre being left open for several hours after the cleaning staff had finished for the day, it was not feasible to leave a Bac2Work solution on the surface overnight in case someone slipped. Instead, cleaning staff applied the product each morning at around 4.00am, scrubbing it with a Doodlebug and soft pad and allowing it to sit and activate for an hour. It was then pressure washed clean with normal floor washing resuming for the rest of the day. The brown urine stains quickly lifted from the flooring, leaving behind faint white marks where the urine had eaten into the floor. The Cleaning Contractor’s Manager from United Facility Group P/L, Rodney Watkins, was very happy with the results, especially considering that they could only leave the product on the surface for one hour in the morning instead of overnight. “As evidence from the photos, the brown stains are gone,” said Rodney Watkins. Rodney said he would definitely recommend Bac2Work to someone else struggling with this problem. “From using the product there has been no further damage or staining,” said Rodney Watkins. Bac2work is a highly effective biological washroom cleaner that works by degrading organic soiling to completely eradicate stains and odours. Use on porous washroom surfaces such as flooring materials and tile grouting, especially around urinals and toilets where soiling has been absorbed below the surface. 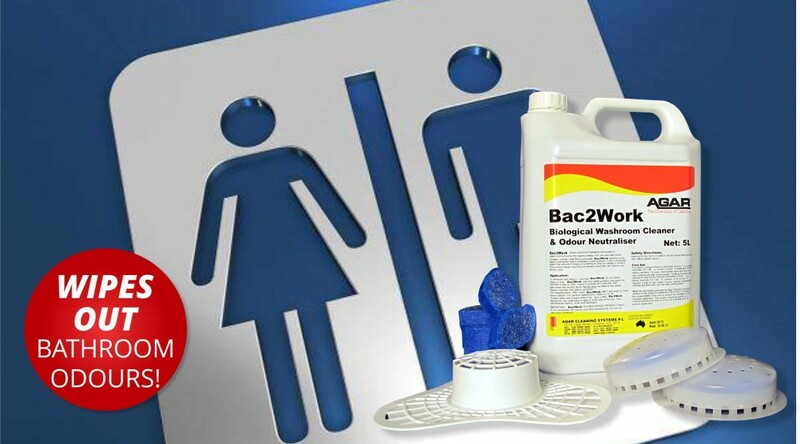 Bac2work can also be used to remove organic deposits on toilet bowls, sinks, showers, urinals, taps and fittings, basically all washroom fittings except glass and touch points. The product is also highly effective for reducing odours in commercial kitchen grates and drains. For more information about Agar’s Bac2Work biological cleaner, other bathroom cleaning products or their full range of cleaning supplies, please contact us on 1300 301 302 or via sales@agar.com.au.